Popular vote by congressional district. As this is a first-past-the-post election, seat totals are not determined by total popular vote in the state, but instead by results in each congressional district. The 2018 United States House of Representatives elections in New York were held November 6, 2018 to elect a U.S. Representative from each of New York's 27 congressional districts. The elections coincided with the gubernatorial election, as well as an election to the United States Senate and various state and local elections. Contested primaries were held June 26, 2018. On Election Day, Democrats gained three New York House seats, and the Democratic Party retook control of the House of Representatives. Democrats won a total of 21 New York House seats, while Republicans won six. Elections were held in all 27 of New York's congressional districts in 2018. 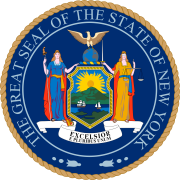 Prior to the 2018 elections, one New York House seat was vacant due to the death of Rep. Louise Slaughter (D-25th District) on March 16, 2018. In the June 26, 2018 Democratic primary in District 14, insurgent Alexandria Ocasio-Cortez upset longtime incumbent Rep. Joe Crowley. On November 6, 2018, the Democratic Party held the open seat in District 25 and defeated three Republican incumbents; with the exception of Crowley, all Democratic incumbent members of Congress in New York were re-elected. The defeated Republican incumbents were Rep. Dan Donovan (R-11th District) (defeated by Democrat Max Rose), Rep. John Faso (R-19th District) (defeated by Democrat Antonio Delgado), and Rep. Claudia Tenney (R-22nd District) (defeated by Democrat Anthony Brindisi. Incumbent Rep. Chris Collins (R-27th District) was narrowly re-elected despite having been arrested on insider trading charges in August 2018. Democrats won a total of 21 New York House seats, while Republicans won six. Nationally, the Democratic Party won control of the House of Representatives on Election Day. The 1st district is located in eastern Long Island and includes most of central and eastern Suffolk County. The incumbent was Republican Lee Zeldin, who had represented the district since 2015. He was re-elected to a second term with 58% of the vote in 2016. New York's 1st district was included on the initial list of Republican-held seats being targeted by the Democratic Congressional Campaign Committee in 2018. In mid-September, Gershon said his campaign had raised more than $1.25 million since July 1, with contributions averaging $85. At the end of September, the nonpartisan Washington, D.C.-based Cook Political Report rated the race as "Likely Republican;" the "Likely" designation is for seats "not considered competitive at this point, but hav[ing] the potential to become engaged." The 2nd district is based along the South Shore of Long Island and includes southwestern Suffolk County and a small portion of southeastern Nassau County. The incumbent was Republican Peter T. King, who had represented the district since 2013 and previously represented the 3rd district from 1993 to 2013. He was re-elected to a thirteenth term with 62% of the vote in 2016. The 3rd district includes most of the North Shore of Long Island. It covers northwestern Suffolk County, northern Nassau County, and northeastern Queens. The incumbent was Democrat Tom Suozzi, who had represented the district since 2017. He was elected to replace retiring Representative Steve Israel with 53% of the vote in 2016. New York's 3rd district was included on the initial list of Democrat-held seats being targeted by the National Republican Congressional Committee in 2018. The 4th district is located in central and southern Nassau County. The incumbent was Democrat Kathleen Rice, who had represented the district since 2015. She was re-elected to a second term with 59.5% of the vote in 2016. The 5th district is mostly located within Queens in New York City, but also includes a small portion of Nassau County. The incumbent was Democrat Gregory Meeks, who had represented the district since 2013 and previously represented the 6th district from 1998 to 2013. He was re-elected to a tenth term with 85% of the vote in 2016. The 6th district is located entirely within Queens in New York City. The incumbent was Democrat Grace Meng, who had represented the district since 2013. She was re-elected to a third term with 72% of the vote in 2016. The 7th district is located entirely in New York City and includes parts of Brooklyn, Queens, and Manhattan. The incumbent was Democrat Nydia Velázquez, who had represented the district since 2013 and previously represented the 12th district from 1993 to 2013. She was re-elected to a thirteenth term with 91% of the vote in 2016. The 8th district is located entirely in the New York City boroughs of Brooklyn and Queens. The incumbent was Democrat Hakeem Jeffries, who had represented the district since 2013. He was re-elected to a third term with 93% of the vote in 2016. The 9th district is located entirely within the New York City borough of Brooklyn. The incumbent was Democrat Yvette Clarke, who had represented the district since 2013 and previously represented the 11th district from 2007 to 2013. She was re-elected to a sixth term with 92% of the vote in 2016. The 10th district is located in New York City and includes the Upper West Side of Manhattan; the west side of Lower Manhattan, including Greenwich Village and the Financial District; and parts of Brooklyn, including Borough Park. The incumbent was Democrat Jerrold Nadler, who had represented the district since 2013 and previously represented the 8th district from 1993 to 2013 and the 17th district from 1992 to 1993. He was re-elected to a thirteenth full term with 78% of the vote in 2016. The 11th district is located entirely in New York City and includes all of Staten Island and parts of southern Brooklyn. The incumbent was Republican Dan Donovan, who had represented the district since 2015. He was re-elected to a second term with 62% of the vote in 2016. New York's 11th district was included on the initial list of Republican-held seats being targeted by the Democratic Congressional Campaign Committee in 2018. Former Congressman Michael Grimm, who resigned in 2014 after pleading guilty to federal tax fraud charges for which he served eight months in prison, challenged Donovan in the primary. Dan Donovan, the incumbent Congressman, also ran in the primary for the Conservative Party of New York State. The 12th district is located entirely in New York City and includes several neighborhoods in the East Side of Manhattan, Greenpoint and western Queens. The incumbent was Democrat Carolyn Maloney, who had represented the district since 2013 and previously represented the 14th district from 1993 to 2013. She was re-elected to a thirteenth term with 83% of the vote in 2016. The 13th district is located entirely in New York City and includes Upper Manhattan and a small portion of the western Bronx. The incumbent was Democrat Adriano Espaillat, who had represented the district since 2017. He was elected to replace retiring Representative Charles Rangel with 89% of the vote in 2016. The 14th district is located in New York City and includes the eastern Bronx and part of north-central Queens. The incumbent was Democrat Joseph Crowley, a leader of the New Democrat Coalition, who had represented the district since 2013. Crowley previously represented the 7th district from 1999 to 2013. He was re-elected to a tenth term with 83% of the vote in 2016. Crowley, who had been named as a potential successor to Nancy Pelosi as House Leader or Speaker, sought re-election in 2018. Backed by the organization Brand New Congress, Democrat Alexandria Ocasio-Cortez challenged Crowley in the June primary. Ocasio-Cortez was an organizer in Bernie Sanders' 2016 presidential campaign. She alleged that Crowley was not progressive enough for the district. She defeated Crowley in the Democratic primary election. However, Crowley remained on the ballot on the Working Families Party line. The Kid Mero, comedian, former co-host of Viceland's Desus & Mero and current co-host of Showtime's Desus & Mero. The 15th district is located entirely within The Bronx in New York City and is one of the smallest districts by area in the entire country. The incumbent was Democrat José E. Serrano, who had represented the district since 2013, and previously represented the 16th district from 1993 to 2013 and the 18th district from 1990 to 1993. He was re-elected to a fourteenth full term with 95% of the vote in 2016. The 16th district is located in the northern part of The Bronx and the southern half of Westchester County, including the cities of Mount Vernon, Yonkers and Rye. The incumbent was Democrat Eliot Engel, who had represented the district since 2013 and previously represented the 17th district from 1993 to 2013 and the 19th district from 1989 to 1993. He was re-elected to a fifteenth term with 95% of the vote in 2016. The 17th district contains all of Rockland County and the northern and central portions of Westchester County, including the cities of Peekskill and White Plains. The incumbent was Democrat Nita Lowey, who had represented the district since 2013 and previously represented the 18th district from 1993 to 2013 and the 20th district from 1989 to 1993. She was re-elected to a fifteenth term unopposed in 2016. The 18th district is located entirely within the Hudson Valley, covering all of Orange County and Putnam County, as well as parts of southern Dutchess County and northeastern Westchester County. The incumbent was Democrat Sean Patrick Maloney, who had represented the district since 2013. He was re-elected to a third term with 56% of the vote in 2016. New York's 18th district has been included on the initial list of Democratic held seats being targeted by the National Republican Congressional Committee in 2018. The 19th district is located in New York's Hudson Valley and Catskills regions and includes all of Columbia, Delaware, Greene, Otsego, Schoharie, Sullivan and Ulster counties, and parts of Broome, Dutchess, Montgomery and Rensselaer counties. The incumbent was Republican John Faso, who had represented the district since 2017. He was elected to replace retiring Representative Chris Gibson with 54% of the vote in 2016. The Democratic nominee was Antonio Delgado. Actress Diane Neal ran under the newly created Friends of Diane Neal ballot line. New York's 19th district was included on the initial list of Republican-held seats being targeted by the Democratic Congressional Campaign Committee in 2018. The 20th district is located in the Capital District and includes all of Albany and Schenectady Counties, and portions of Montgomery, Rensselear and Saratoga Counties. The incumbent was Democrat Paul Tonko, who had represented the district since 2013 and previously represented the 21st district from 2009 to 2013. He was re-elected to a fifth term with 68% of the vote in 2016. The 21st district, the state's largest and most rural congressional district, includes most of the North Country and the northern suburbs of Syracuse. The district borders Vermont to the east. The incumbent was Republican Elise Stefanik, who had represented the district since 2015. She was re-elected to a second term with 65% of the vote in 2016. Farmer and real estate broker Russ Finley planned on making a primary challenge of Stefanik, but later withdrew from the race, leaving Stefanik unopposed in the primary. Past Green Party nominee Matt Funiciello announced that he would not run in 2018. Lynn Kahn was the Green Party candidate in 2018. The 22nd district is located in Central New York and includes all of Chenango, Cortland, Madison and Oneida counties, and parts of Broome, Herkimer, Oswego and Tioga counties. The incumbent was Republican Claudia Tenney, who had represented the district since 2017. She was elected to replace retiring Representative Richard Hanna with 47% of the vote in 2016. New York's 22nd district was included on the initial list of Republican-held seats being targeted by the Democratic Congressional Campaign Committee in 2018. The 23rd district includes all of Allegany, Cattaraugus, Chautauqua, Chemung, Schuyler, Seneca, Steuben, Tompkins and Yates counties, along with parts of Ontario and Tioga counties. The incumbent was Republican Tom Reed, who had represented the district since 2013 and previously represented the 29th district from 2009 to 2013. He was re-elected to a fifth term with 58% of the vote in 2016. Although Della Pia finished slightly ahead of the other candidates on primary election night, he conceded to Mitrano after absentee ballots were counted. Tracy Mitrano, who also ran in the Democratic primary, ran unopposed for the Women's Equality Party nomination. The 24th district includes all of Cayuga, Onondaga and Wayne counties, and the western part of Oswego County. The incumbent was Republican John Katko, who had represented the district since 2015. He was re-elected to a second term with 61% of the vote in 2016. New York's 24th district was included on the initial list of Republican-held seats being targeted by the Democratic Congressional Campaign Committee in 2018. The 25th district is located entirely within Monroe County, centered on the city of Rochester. The seat was vacant due to the March 2018 death of incumbent Democratic Representative Louise Slaughter, who represented the district from 2013 to 2018 and previously represented the 28th district from 1993 to 2013 and the 30th district from 1987 to 1993. Following precedent set in 2010, two concurrent elections were held in November 2018. One election was held to fill the seat for the 2018 lame-duck session, and another was held to fill the seat for the 2019–2020 term. The 26th district is located in Erie and Niagara counties and includes the cities of Buffalo and Niagara Falls. The incumbent was Democrat Brian Higgins, who had represented the district since 2013, and previously represented the 27th district from 2005 to 2013. He was re-elected to a seventh term with 75% of the vote in 2016. The 27th district is located in Western New York and includes all of Orleans, Genesee, Wyoming and Livingston counties, and parts of Erie, Monroe, Niagara and Ontario counties. On August 11, 2018, incumbent Republican Chris Collins, who had represented the district since 2013 and was re-elected to a third term with 67% of the vote in 2016, announced that he would withdraw from his re-election campaign after being arrested for insider trading. Removing himself from the ballot would have required Collins to be nominated as a dummy candidate in another election or to move his legal place of residence out of state (he has additional homes in Florida and the District of Columbia). On September 17, 2018, Collins announced that he had changed course and would campaign for re-election in November after all. New York's 27th district was included on the initial list of Republican-held seats being targeted by the Democratic Congressional Campaign Committee in 2018. Carl Paladino, 2010 gubernatorial nominee, former member of the Buffalo Public Schools Board of Education and founder of Ellicott Development Co.
^ "Rep. Louise Slaughter: How will her successor be chosen?". Rochester Democrat and Chronicle. ^ CNN, Lauren Fox, Deirdre Walsh and Sunlen Serfaty. "Trailblazing New York Democrat dies at 88". CNN. ^ "In Stunning Upset, Ocasio-Cortez Defeats Rep. Crowley in NY - RealClearPolitics". realclearpolitics.com. ^ a b c "Complete results for every Congressional race in New York State: Dems gain 3 seats". syracuse.com. ^ "U.S. House races: Democrats pick up seats in New York". Rochester Democrat and Chronicle. ^ CNN, Ashley Killough and Maeve Reston. "Two GOP congressman facing indictment win re-election, CNN projects". CNN. ^ "Rep. Chris Collins arrested on insider trading charges". ABC News. ^ "Democrats seize control of House, power to investigate President Trump". USA TODAY. ^ a b c d e f Cheney, Kyle (January 30, 2017). "Amid Democratic doldrums, DCCC identifies 2018 targets". Politico. Retrieved March 23, 2017. ^ a b c Riga, Kate (July 25, 2017). "Thiele, Others Consider Challenging Zeldin In 2018". The Southampton Press. Retrieved August 2, 2017. ^ a b Brand, Rick (July 29, 2017). "Jockeying to challenge Rep. Lee Zeldin begins". Newsday. Retrieved August 2, 2017. ^ LaRocco, Paul (August 24, 2017). "Former Brookhaven Lab physicist, Elaine DiMasi, in Congress race". Newsday. Retrieved August 27, 2017. ^ "Perry Gershon for Congress". Retrieved February 24, 2018. ^ "Vivian Viloria-Fisher for Congress". Retrieved August 27, 2017. ^ Henry Oh, Jinsoon (January 20, 2018). "Hearing Out Democratic Congressional Candidates". East End Beacon. Retrieved February 9, 2018. ^ "Pechefsky for Congress". Retrieved February 9, 2018. ^ "Brendon Henry for Congress". Retrieved August 27, 2017. ^ Pink, Aiden (May 11, 2017). "Political Novice Targets Lee Zeldin, Citing His Vote To Repeal Obamacare". The Forward. Retrieved May 12, 2017. ^ Finn, Lisa (May 12, 2017). "Sag Harbor Woman Aims To Unseat Rep. Zeldin In Congress". Southampton Patch. Retrieved May 14, 2017. ^ Brand, Rick (July 19, 2017). "David Calone won't challenge Lee Zeldin for Congress". Newsday. Retrieved August 2, 2017. ^ Dobie, Michael (March 16, 2017). "A potential challenger for Lee Zeldin emerges". Newsday. Retrieved April 18, 2017. ^ Riga, Kate (October 2, 2017). "Thiele Not Going To Run For Zeldin's Congressional Seat In 2018". The Southampton Press. Retrieved October 2, 2017. ^ Schwartz, David M. (September 14, 2018). "DCCC makes Gershon race a top-tier contest". Newsday. Retrieved September 29, 2018. ^ Schwartz, David M. (September 26, 2018). "DCCC makes Gershon race a top-tier contest". Newsday. Retrieved September 29, 2018. ^ Donald J. Trump [@realDonaldTrump] (September 26, 2018). "Congressman Lee Zeldin is doing a fantastic job in D.C. Tough and smart, he loves our Country and will always be there to do the right thing. He has my Complete and Total Endorsement!" (Tweet) – via Twitter. ^ Donald J. Trump. "Congressman Peter King of New York is a hardworking gem. Loves his Country and his State. Get out and VOTE for Peter!". Twitter. ^ a b Isenstadt, Alex (February 8, 2017). "House Republicans name Democratic targets for 2018". Politico. Retrieved March 23, 2017. ^ "Mizan for Congress". Mizan for Congress. Retrieved June 8, 2018. ^ "Home". AchilleForCongress.com. Retrieved June 8, 2018. ^ a b Shapiro, Rachel (May 15, 2017). "Conservative voters chide Donovan while 3 Dems challenge". Staten Island Advance. Retrieved May 16, 2017. ^ Bowman, Bridget (August 2, 2017). "Army Vet Max Rose to Challenge GOP Rep. Dan Donovan". Roll Call. Retrieved August 2, 2017. ^ Shapiro, Rachel (September 22, 2017). "Sixth Dem, a lifelong Staten Islander, challenges Donovan". Staten Island Advance. Retrieved January 14, 2018. ^ Katinas, Paula (May 4, 2017). "Retired boxer plans to run against Donovan". Brooklyn Eagle. Retrieved May 4, 2017. ^ Bredderman, Will (May 8, 2017). "Democratic Candidate for Staten Island's House Seat Isn't a Democrat and Doesn't Live on Staten Island". New York Observer. Retrieved May 16, 2017. ^ Katinas, Paula (June 1, 2017). "Ex-cop announces run for Donovan's House seat". Brooklyn Eagle. Retrieved June 2, 2017. ^ Michel, Clifford (March 4, 2018). "Island government: Donovan gets endorsements; Dem drops out of race". Staten Island Advance. Retrieved June 22, 2018. ^ Rauh, Grace (August 2, 2017). "Michael Grimm eyes return to Congress". NY1. Retrieved August 4, 2017. ^ Shapiro, Rachel (August 3, 2017). "Former Grimm supporters don't see path to victory if he runs for Congress". Staten Island Advance. Retrieved August 4, 2017. ^ Donald J. Trump. "There is no one better to represent the people of N.Y. and Staten Island (a place I know very well) than @RepDanDonovan, who is strong on Borders & Crime, loves our Military & our Vets, voted for Tax Cuts and is helping me to Make America Great Again. Dan has my full endorsement!". Twitter. ^ Kane, Paul (February 8, 2018). "In the shadow of Nancy Pelosi, Joseph Crowley campaigns — but for what?". The Washington Post. ^ Barkan, Ross (June 19, 2017). "The Most Powerful Democrat In Queens Must Finally Compete". Village Voice. Retrieved August 27, 2017. ^ Joyce, A.P., "Meet the young, progressive Latina trying to oust one of the most powerful Democrats in the House," Mic, February 18, 2018. ^ Sakellis, Eleni. "Prof. Anthony Pappas Running for Congress". The National Herald. The National Herald, Inc. Retrieved August 21, 2018. ^ Gray, Briahna; Grim, Ryan (June 13, 2018). "Under Pressure From Progressives, Rep. Ro Khanna Endorses Both Democrats in Contentious New York Primary". The Intercept. ^ Gabbard, Tulsi (June 27, 2018). ". @Ocasio2018 Congratulations on your historic win last night! Throughout your activism and your campaign, you demonstrated positive, strong, principled leadership that is focused on serving the people and protecting our planet. I look forward to working with you". ^ @AyannaPressley (June 21, 2018). ". @Ocasio2018 my sister in service, my team and I are humbled by your leadership and honored to have your back. May we both have the privilege to serve together in Congress and lift the voices of everyone in our districts #changecantwait #ma7 #ny14 #mapoli #bospoli #nypoli" (Tweet) – via Twitter. ^ "New York Daily News". nydailynews.com. Retrieved May 25, 2018. ^ "Alexandria Ocasio-Cortez on Twitter". ^ Dore, Jimmy (June 7, 2017). "Progressive Alexandria Ocasio Cortez Is Primarying Corporate Democrat In New York". YouTube. The Jimmy Dore Show. ^ Fantano, Anthony [@theneedledrop] (June 27, 2018). "THIS IS EXCELLENT!" (Tweet). Retrieved September 9, 2018 – via Twitter. ^ "Insanely Corrupt Democrat Rigs Process Against Progressive Challenger". YouTube. Secular Talk. March 27, 2018. ^ @THEKIDMERO (June 15, 2018). "TIRA PA'LANTE!!!!" (Tweet) – via Twitter. ^ @THEKIDMERO (June 26, 2018). "IM RIDING WITH @Ocasio2018!! YOU SHOULD BE TOO. LETS GET THESE OLD WASHED YAKUBS OUTTA HERE" (Tweet) – via Twitter. ^ @LCMoser (June 15, 2018). "Go, go, @Ocasio2018!" (Tweet) – via Twitter. ^ @ZephyrTeachout (May 31, 2018). "Today I am proud to endorse the gutsy, hopeful, grassroots campaign of Alexandria Ocasio-Cortez for Congress" (Tweet) – via Twitter. ^ "Alexandria Ocasio-Cortez Takes On Corporate Democrat Joe Crowley". YouTube. The Young Turks. April 4, 2018. ^ @MaraWilson (June 26, 2018). "If I still lived in New York, you would have my vote!" (Tweet) – via Twitter. ^ Appelbaum, Stuart (June 28, 2018). "RWDSU Endorses Ocasio-Cortez for Congress". Retail, Wholesale and Department Store Union. ^ "Candidates | Brand New Congress". brandnewcongress.org. ^ Dean, Jim (June 22, 2018). "Democracy for America : Democracy for America endorses Alexandria Ocasio-Cortez for Congress in NY-14". democracyforamerica.com. Democracy for America. ^ Media, Wire Service. "DSA Endorse Four More Women in California and New York :: Wire Service Media". ^ "Justice Democrats | Candidates". now.justicedemocrats.com. ^ MoveOn [@MoveOn] (June 18, 2018). "#MoveOn members in #NY14 have overwhelmingly voted to endorse Ocasio2018 for the #NY14 U.S. House seat!" (Tweet) – via Twitter. ^ "Alexandria Ocasio-Cortez". Our Revolution. ^ Lipton, Bill. "New York - Working Families Endorsements". Working Families. ^ Campanile, Carl (June 16, 2018). "Queens Democratic club snubs longtime Rep. Joe Crowley". New York Post. ^ "Endorsements". People for Bernie Sanders. ^ Lieberman, Joe. "Vote Joe Crowley, for Working Families". Wall Street Journal. ^ Harris, Lee. "Joe Lieberman urges New Yorkers to vote for Joe Crowley over Ocasio-Cortez". ABC News. ^ "Election Results New York House District 14". New York Times. November 8, 2018. Retrieved November 8, 2018. ^ McKenna, Chris (January 31, 2018). "Maloney challenger opens campaign". Times Herald-Record. Retrieved February 2, 2018. ^ "Diane Neal wins court battle to appear on 19th Congressional District ballot". Daily Freeman. September 17, 2018. Retrieved October 17, 2018. ^ Kirby, Paul (June 21, 2017). "Woodstock teacher Jeffrey Beals touts 'strong record of public service' in running for 19th Congressional District seat". Daily Freeman. Retrieved June 23, 2017. ^ Hamilton, Matthew (June 5, 2017). "Democrat Antonio Delgado makes NY-19 bid official". Times Union. Retrieved June 5, 2017. ^ Moody, Richard (May 10, 2017). "Hunter businessman to challenge Faso". The Register Star. Retrieved May 17, 2017. ^ Kirby, Paul (June 7, 2017). "Seventh Democrat announces bid to run for seat held by Rep. Faso". Daily Freeman. Retrieved June 8, 2017. ^ "Smelling Blood, Democrats Swarm New York House Race". Retrieved June 29, 2018. ^ "CD 19 candidate Erin Collier: A fresh face with deep roots". Times Union. May 20, 2018. Retrieved June 6, 2018. ^ Dunne, Allison (May 12, 2017). "A Number Of Democrats Weigh Challenging Congressman Faso in 2018". WAMC. Retrieved May 16, 2017. ^ Doxsey, Patricia (August 3, 2017). "Ulster County Exec Hein says he won't run for Congress in 2018". Daily Freeman. Retrieved August 3, 2017. ^ a b Hamilton, Matthew (April 11, 2017). "Will Yandik won't seek NY-19 seat in 2018". Times Union. Retrieved April 18, 2017. ^ Zangla, Ariel (May 17, 2017). "Field of Faso election challengers grows". Daily Freeman. Retrieved May 17, 2017. ^ "New York 2018 General Election". The Green Papers. September 25, 2017. Retrieved October 15, 2017. ^ Respers France, Lisa (February 7, 2018). "'Law & Order: SVU' star running for Congress". CNN. Retrieved February 8, 2018. ^ Nanci, Matthew. "Actress Diane Neal wins appeal to run against Faso, Delgado". Record Online. Gatehouse Media, LLC. Retrieved September 18, 2018. ^ Zangla, Ariél (August 24, 2018). "ELECTION 2018: Nominating petitions of actress Diane Neal, fellow independent Dal LaMagna ruled invalid in NY 19th Congressional District". The Daily Freeman. Retrieved August 27, 2018. ^ Donald J. Trump. "Congressman John Faso of New York has worked hard and smart. Strong on Crime, Borders and our 2nd Amendment, John is respected by all. Vote for John. He has my complete and total Endorsement!". Twitter. ^ Barack Obama [@BarackObama] (August 1, 2018). "Today I'm proud to endorse such a wide and impressive array of Democratic candidates – leaders as diverse, patriotic, and big-hearted as the America they're running to represent:" (Tweet). Retrieved August 1, 2018 – via Twitter. ^ Brian Schatz. "Every seat counts equally but it is especially important that Delgado wins to repudiate this racist trash". Twitter. ^ a b 1% won't vote. ^ Thompson, Maury (August 1, 2017). "Boyajian enters congressional race". The Post-Star. Retrieved August 1, 2017. ^ Molongoski, Brian (July 5, 2017). "Democrat Tedra Cobb to challenge Stefanik for NY-21 seat". Watertown Daily Times. Retrieved July 5, 2017. ^ Raymo, Denise (July 12, 2017). "Democrat Emily Martz announces candidacy in 21st Congressional District". The Post-Star. Retrieved July 13, 2017. ^ Thompson, Maury (January 30, 2017). "Political activist will run for Congress". The Post-Star. Retrieved January 31, 2017. ^ Pedersen, Erik (February 21, 2018). "MSNBC Alum Dylan Ratigan Running For Congress". Deadline. Retrieved June 28, 2017. ^ Thompson, Maury (June 27, 2017). "Second Democratic congressional candidate announces in NY21". The Post-Star. Retrieved June 28, 2017. ^ a b Thompson, Maury (January 27, 2017). "'A lot of' NY21 Dems looking at 2018". The Post-Star. Retrieved May 8, 2017. ^ Thompson, Maury (June 30, 2017). "Two more Democrats poised to enter 2018 NY21 primary race, two more considering". The Post-Star. Retrieved July 5, 2017. ^ Olivero, Antonio (May 6, 2017). "Several mull Stefanik challenge for 21st Congressional District". Adirondack Daily Enterprise. Retrieved May 8, 2017. ^ Thompson, Maury (July 26, 2017). "St. Lawrence County farmer to challenge Stefanik in GOP primary". The Post-Star. Retrieved July 27, 2017. ^ Thompson, Maury (August 1, 2017). "Funiciello to forgo third run for Congress". The Post-Star. Retrieved August 3, 2017. ^ Blanchard, Peter. "Cincinnatus man will challenge CNY Congresswoman Claudia Tenney in 2018". Cortland Voice. Retrieved August 21, 2017. ^ Harding, Robert (August 14, 2018). "'I'm here for Claudia': Trump boosts Tenney at Utica fundraiser". The Auburn Citizen. ^ Claudia Tenney. "Our team was thrilled to welcome @EricTrump to #NY22 today! Thanks to the policies of @realDonaldTrump, our economy is booming and jobs are coming back from overseas. Republicans are fired up and ready to stop Nancy Pelosi from becoming Speaker!". Twitter. ^ "NFIB Endorses Tenney for Re-election". Observer-Dispatch. August 21, 2018. ^ "Endorsements For New York November 6 General Election". New York Post. October 20, 2018. ^ Golden, Vaughn (July 5, 2017). "2018 Congressional Challengers: Max Della Pia". Ithaca Times. Retrieved July 6, 2017. ^ O'Connor, Kelsey (May 12, 2017). "Political newcomer Ian Golden enters race for New York's 23rd Congressional District". The Ithaca Voice. Retrieved May 12, 2017. ^ "Mitrano officially kicks off Congressional run". Ithaca Times. September 6, 2017. Retrieved September 6, 2017. ^ Zremski, Jerry (June 22, 2017). "Jamestown lawyer, 'Star Trek' actor among those challenging Reed". The Buffalo News. Retrieved June 22, 2017. ^ Miller, Rick (July 29, 2017). "DiNapoli encouraged at number of congressional Dem candidates". Olean Times Herald. Retrieved August 2, 2017. ^ "Democrats Searching For Reed Opponent". The Post-Journal. April 25, 2017. Retrieved May 12, 2017. ^ D'Agostino, John (April 28, 2017). "Reed's nonstop race for Congress". The Observer. Retrieved May 12, 2017. ^ Almendarez, Jolene (July 3, 2018). "Democratic Primary: Max Della Pia concedes to Tracy Mitrano". Ithaca Voice. Retrieved August 8, 2018. ^ "Congressman Tom Reed gets shout-out from President Trump". Ithaca Times. October 4, 2018. ^ Weiner, Mark (September 17, 2017). "Syracuse University professor seeks to challenge Rep. John Katko for Congress". syracuse.com. Retrieved September 19, 2017. ^ Parsnow, Luke (April 9, 2018). "Juanita Perez Williams has the right to run for Congress". Syracuse New Times. ^ a b c d Weiner, Mark (July 5, 2017). "7 Democrats who may challenge John Katko for Congress". Syracuse.com. Retrieved July 11, 2017. ^ Harding, Robert (June 7, 2017). "Cuomo targets Republicans in NY races for Congress — but not Katko". The Citizen. Retrieved June 10, 2017. ^ Harding, Robert (July 11, 2017). "First Democrat to announce bid to unseat Rep. John Katko in CNY race for Congress". The Citizen. Retrieved July 11, 2017. ^ Lisa W. Foderaro (January 25, 2018). "Stephanie Miner Rules Out Bid for Congress, but May Yet Challenge Cuomo". The New York Times. ^ "Cuomo Synchronizes NY-25 Special With General Election". nystateofpolitics.com. ^ "City Councilman Adam McFadden running for Congress". WHAM. March 30, 2018. ^ "Assemblyman Joseph Morelle to run for Louise Slaughter's congressional seat". Rochester Democrat and Chronicle. Retrieved March 26, 2018. ^ a b Gorbman, Randy (March 26, 2018). "Candidates for 25th Congressional seat announcing". WBFO. Retrieved March 29, 2018. ^ "Building on the Legacy of Progressive Leadership for the Rochester Region". crowdpac.com. ^ Moule, Jeremy (March 28, 2018). "Wilt launches House bid, picks up progressive group's endorsement". Rochester City Newspaper. Retrieved April 2, 2018. ^ "Race heats up to fill Slaughter's House seat". The Hill. March 27, 2018. Retrieved April 2, 2018. ^ Cleveland, Will (April 4, 2018). "Rachel Barnhart secures signatures for congressional primary to run for Slaughter's seat". Democrat & Chronicle. Retrieved April 6, 2018. ^ "Rachel Barnhart to announce bid for 25th Congressional District seat". WHAM. April 17, 2018. Retrieved April 18, 2018. ^ Campbell, Joe; Orr, Steve (March 16, 2018). "Rep. Louise Slaughter: How will her successor be chosen?". Democrat & Chronicle. Retrieved March 18, 2018. ^ "Log In or Sign Up to View". facebook.com. ^ Domingues, Christina (March 22, 2018). "JOSEPH ROBACH AMONG LIST OF CANDIDATES CONSIDERING RUN FOR SLAUGHTER'S SEAT". Spectrum News Rochester. Retrieved March 23, 2018. ^ "Neurosurgeon Dr. Jim Maxwell announces candidacy for Congress". 13wham.com. January 13, 2018. Retrieved January 17, 2018. ^ Goldmacher, Shane; Foderaro, Lisa W. "Reversing Course, Chris Collins Will Seek 4th House Term Despite Indictment". NYTimes. The New York Times Company. Retrieved September 17, 2018. ^ "Grand Island town supervisor joins four other Dems to challenge Chris Collins". Retrieved May 22, 2018. ^ "Cole Ends Short-Lived Challenge to Collins". nystateofpolitics.com. Retrieved January 6, 2018. ^ Touhey, Ali (October 19, 2017). "Sean Bunny to challenge Rep. Chris Collins in 2018 Election". WKBW. Retrieved January 6, 2018. ^ "Bunny ends congressional race against Collins as McMurray gains strength". ^ "Mumford businessman announces Congressional run". The Daily News. Retrieved January 6, 2018. ^ "Field narrows to one for Democratic challenger to Chris Collins". The Buffalo News. Retrieved April 9, 2018. ^ "Collins faces challenge from 26-year-old GOP newcomer". The Buffalo News. July 6, 2017. Retrieved January 6, 2018. ^ Owens, Howard B. (December 15, 2017). "Erie County businessman says he can fix what's wrong with Congress, announces candidacy in NY-27". The Batavian. Retrieved January 6, 2018. ^ "8 candidates for Collins' seat meet in Livingston County". WIVB. August 16, 2018. ^ Anstey, Evan (August 21, 2018). "Bellavia no longer seeking to replace Chris Collins". WIVB-TV. Nexstar Media Group. Retrieved August 21, 2018. ^ a b c d e f g Haight, Alex. "9 candidates make their case to replace Collins". Spectrum Local News. Charter Communications. Retrieved August 23, 2018. ^ "Poll: GOP maintains edge in NY-27 as search for candidate begins". spectrumlocalnews.com. ^ Licastro, Troy. "Erie County Comptroller Stefan Mychajliw says he will run in Collins' place". WIVB. Nexstar Broadcasting, Inc. Retrieved August 11, 2018. ^ Ross, Franz (August 11, 2018). "Paladino on NY-27: 'I'm all in!'". WIVB-TV. Retrieved August 11, 2018. ^ Anstey, Evan. "Sen. Ranzenhofer no longer seeking to replace Chris Collins". WIVB. Nexstar Broadcasting, Inc. Retrieved August 27, 2018. This page was last edited on 6 April 2019, at 01:45 (UTC).